Pixelache | The Wearable Electronics -course presentation 5.12. 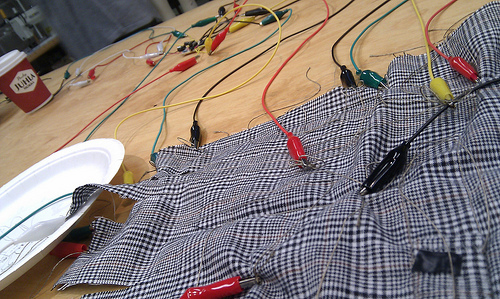 News : The Wearable Electronics -course presentation 5.12. Electronics and sensors allow artists to create interactive smart garments that produce sound and images in reaction to movement. They sense and communicate with the environment and the user, and may react to them. In some cases the garment is in connection with the Internet and exchanges information based on the data it has measured. As the term ‘wearable’ suggests, these interactive artworks are carried by the user and in bodily connection with him or her. The Wearable Electronics course has been organised during autumn 2011 in collaboration between Aalto University School of Art and Design, and MUU Artists’ Association. The participants who come from a variety of backgrounds such as new media, costume design, textile design, fine art and performing arts have been encouraged to create their own visions of wearable technology. They have worked in teams to carry out their ideas based on the Arduino development platform. Welcome to experience these six unique projects – to see them in use and even to try some of them on!